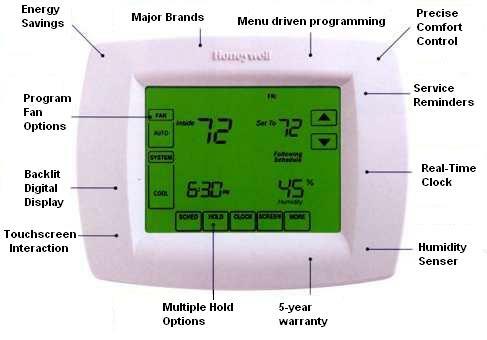 Programmable Thermostats: The advantages abound. 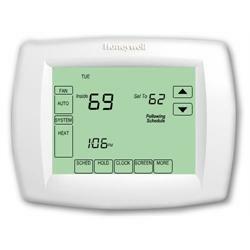 A programmable digital thermostat can be one of the most cost efficient components that you can add to your heating or cooling system(s). 40% of a home's energy consumption is due to heating and cooling usage. A large amount of this energy consumption is due to maintaining whole-house temperatures while the occupants sleep or are away from the home at work and at school. A programmable thermostat allows you to set different temperatures at different times of the day, on different days of the week, for both heating and cooling. When coupled with a zone system, you have even more options. For example, bedrooms are seldom used during the work and school day. These areas can be programmed to drop to a much lower temperature until just before high usage begins. And if plans change, override the programming at the stat, and the zone will soon be back up to temperature. This versatility saves enormously at the meters. Prices vary greatly. The initial cost for a single programmable thermostat can be $40 to about $300. When considering the dollar savings that can be achieved, it doesn't take long to recoup the thermostat's cost. Check into your Utility company's rebates program. Due to the programmable stat's energy saving capabilities, a rebate may be available to pay a good portion of the replacement cost. Systems will operate less frequently. Saves energy and stretches out life expectancy of equipment (savings here, too). With the right choice of programmable stat, humidity and ventilation can be controlled, as well. Fresh air from outside has become more important in today's tightly sealed homes. The average home costs in excess of $800 annually for heating and cooling. A programmable stat can reduce that bill by 20%. Some stats have a vacation mode. Hit vacation as you head out the door, and the entire residence is scaled back until you return. Some units have a keyboard lock, not allowing unauthorized alterations to the preset program. Even the most basic programmable stat can save you money on your utility bills!